"If recent trends continue, Africa will play an increasingly important role in the global economy. By 2040, it will be home to one in five of the planet’s young people, and the size of its labor force will top China’s. 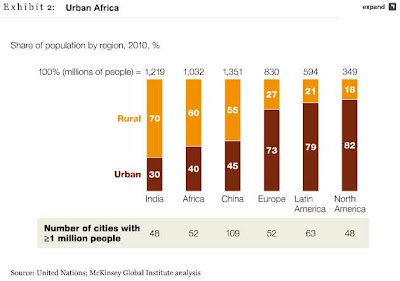 Africa has almost 60 percent of the world’s uncultivated arable land and a large share of the natural resources. 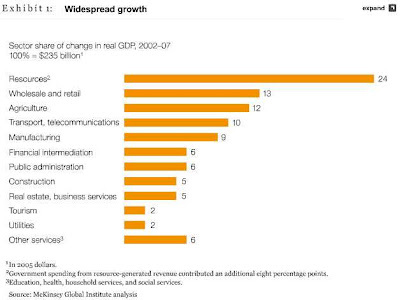 Its consumer-facing sectors are growing two to three times faster than those in the OECD7 countries. And the rate of return on foreign investment is higher in Africa than in any other developing region. Global executives and investors cannot afford to ignore this. A strategy for Africa must be part of their long-term planning. The time for businesses to act on those plans is now. Companies already operating in Africa should consider expanding. For others still on the sidelines, early entry into emerging economies provides opportunities to create markets, establish brands, shape industry structures, influence customer preferences, and establish longterm relationships. Business can help build the Africa of the future. And working together, business, governments, and civil society can confront the continent’s many challenges and lift the living standards of its people." 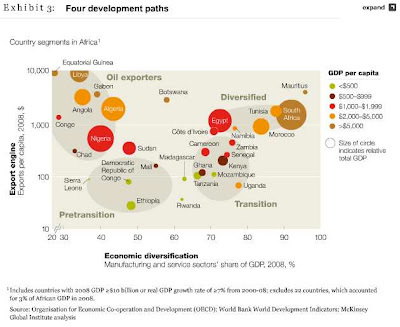 See also sister piece McKinsey's Lions on the Move: The Progress and Potential of African Economies.